With a top jackpot of 120,000 coins, a wild multiplier which cranks up your winnings x4 and up to 30 free spins where winnings are worth x3 you’d be mad not to take the Wild Witches slot game for spin! 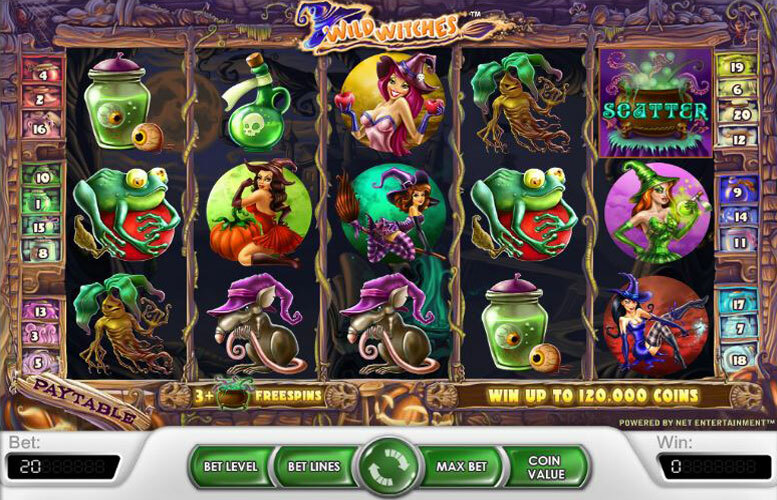 Wild Witches is an online slot machine game made by NetEnt. It is a 5 reel, 20 payline slot machine with the potential for big winnings (max of 120,000 coins). The theme is that of a cute magic cartoon world but it does have a kind of eerie feeling about it. The symbols themselves all are beautifully drawn for an online slot machine game, and the game itself is dripping with features. With two wilds and a scatter, the potential to win big with Wild Witches is huge. 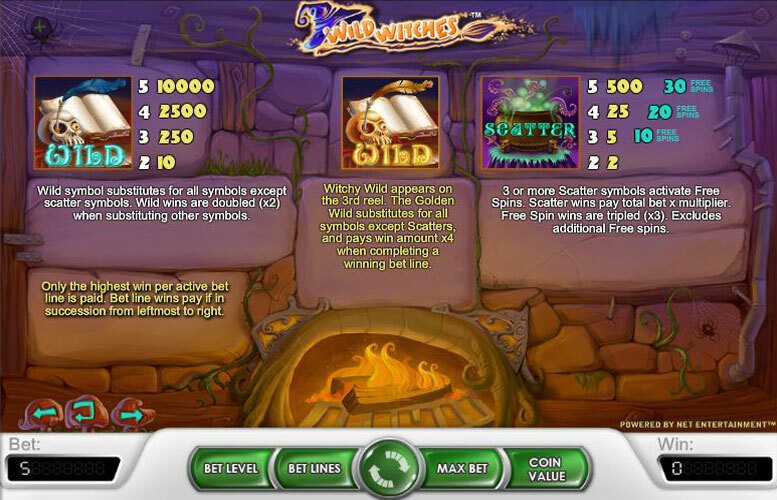 Winning the top coin jackpot in Wild Witches requires you to be playing on bet level 4 (regardless of your coin value). The top prize possible is 120,000 coins and you can collect this by spinning in 5 of the regular (that’s the blue) wild symbols during free spin rounds where you winnings are tripled. The regular Wild pays 10,000 coins for 5 in a row so if you do that on bet level 4 that’s 40,000 and then multiply it by 3 which happens during free spins and you’ve got your 120,000 jackpot prize. Regular Wild: The wild in Wild Witches is represented by a spell book, with a skull beside it and a quill in the skulls eye. It’s colored blue to distinguish it from the more valuable Witchy Wild. Wilds, like in most other online slots, substitute in for everything except the scatter. In Wild Witches, they also serve as a multiplier for your winnings. Getting a wild in a combo gives you a multiplier of x2 when it substitutes in for another symbol. Landing 5 wilds in a line grants a whopping 10000 coins, 4 wilds give 2500 coins, with 3 giving 250 coins and 2 giving 10. Witchy Wild: The Witchy Wild is a unique icon that appears on the third reel only. It is visually identical to the regular wild, except for its color. Everything on the Witchy Wild is tinted gold to represented the big winnings you’ll be getting if you’re lucky enough to land one! The golden wild will still sub in for other symbols, but unlike regular Wilds this one gives you a multiplier of x4 when it shows up in a winning payline. Now THAT is big winnings! Scatter: A Scatter is present and will give you free spins. It’s represented by a cauldron. If you are a lucky player and land 5 scatters in a line, you will get 500 coins and a borderline ridiculous 30 free spins! Free spin wins are give a multiplier of x3, except for additional free spins. Landing 4 scatters in a line will give you 25 coins and 20 free spins, and landing 3 scatters will give you 5 coins and 10 free spins and 2 Scatters give you 2 coins. 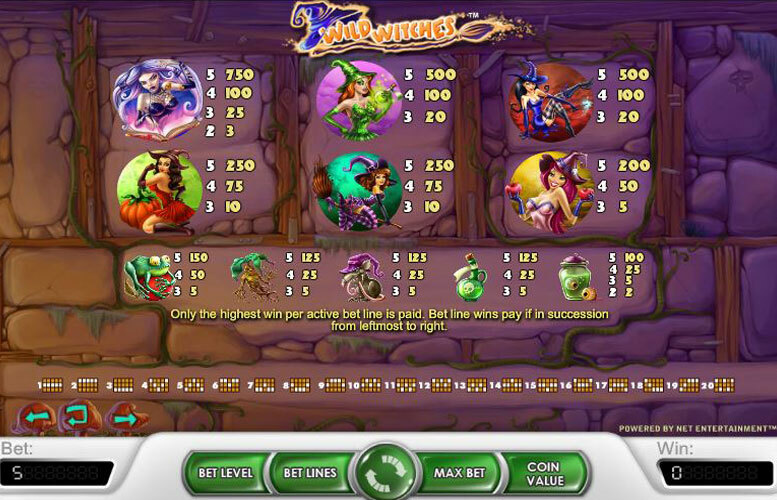 The Witches: There is no point is listing each witch payout here, as that information can be gleaned easily by looking at the paytable in game. There are 6 witches in Wild Witches, and each one is immaculately rendered. The highest paying witch is the purple one, giving 750 coins for 5 in a line, 100 coins for 4, 25 coins for 3 and 3 coins for 2. The lowest paying witch gives 200 coins for 5, 50 coins for 4 and 5 coins for 3. Other Symbols: The lowest paying symbols are a Frog, a Root, a Rat, a Poison Vial and an Eyeball. The Frog is the highest paying, with the Root, Rat and Poison Vial all paying the same. The Eyeball pays the least. You can choose between four different bet levels on the Wild Withces slot machine. Coin values range from 0.01 right up to 1 and there are 20 different paylines to play. The maximum bet per spin, if you are playing in GBP is £80 and the min is 0.01p (assuming lowest coin value and 1 payline). The min bet per spin to cover all paylines is 0.20p. The range should be more than big enough to accommodate the lowest and highest stakes slot players. This game has a rating of 5 / 5 with 279 total reviews by the users.